Hardware to do electricity experiments with NeuLog Sensors. Electricity is very fundamental for any basic physics course; but performing electricity experiments is sometimes complicated and requires complex and expensive equipment. This simple kit combined with NeuLog logger sensors allows students to investigate this field. Ohm's law applies to electrical circuits; it states that the current flowing through the circuit is directly proportional to the voltage and inversely proportional to the resistance. In this experiment you will be able to find out this voltage – current dependence by applying a variable voltage to a given resistance and measuring the generated electric current. In an incandescent lamp; electric current flows through a thin thread called filament. The current heats this filament reaching approximately 3;000oC and this causes the production of heat as well as light. This experiment studies how long it takes the light bulb to finally irradiate light; from the moment current (electrons) begins to flow through the circuit. 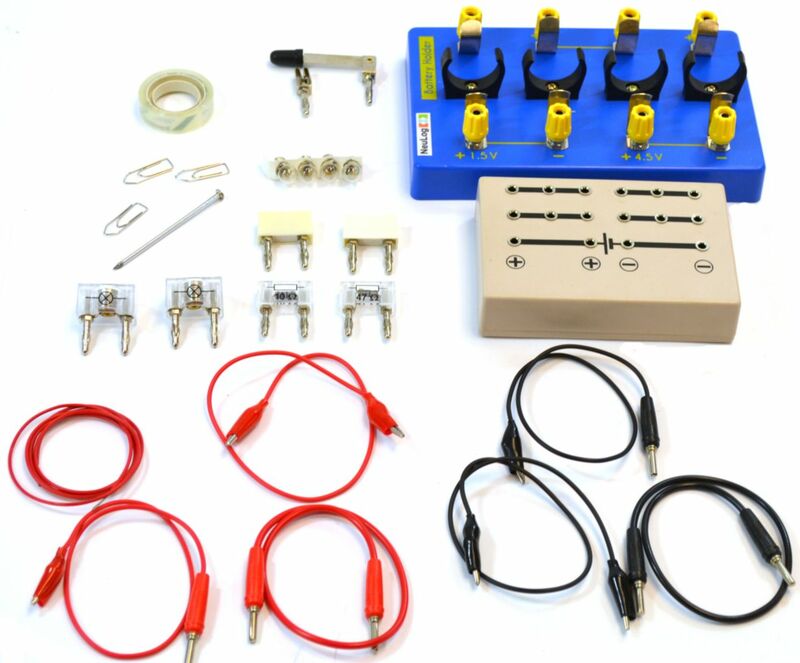 These and other basic and advanced experiments can be easily conducted using this kit along with logger sensors. Ordering information: The kit consists of Utility stand; Circuit board; 6V cell holder; Four 1.5 V batteries; Knife switch; Two bridges; Red 4 mm connector cable; Black 4 mm connector cable; Red crocodile clip cable; Black crocodile clip cable; Red crocodile clip and 4 mm connector cable; Black crocodile clip and 4 mm connector cable; 10Ω mounted resistor; 47Ω mounted resistor; Two mounted bulb holder; Four 6V bulbs; 1 m electrical wire; Large iron nail; Cellotape; Three paper clips; and Activities. NeuLog sensors required, but not included: Voltage logger sensor, Current logger sensor, Light logger sensor, and Magnetic logger sensor.